We found a delicious way to streamline the ravioli making process that doesn't require time-intensive homemade pasta dough. The shortcut? It's in the Asian produce section of the local supermarket next to the tofu. I'm talking about wonton wrappers. Wonton wrappers make excellent filled pasta, like ravioli. You can use wonton wrappers as is or cut them down, and you can fill them with just about anything, including ricotta cheese, ground meat (try a meatball mix) and veggie combinations. Made with the whole wonton wrapper, ravioli are very big and you only need six to eight per person for a satisfying meal. 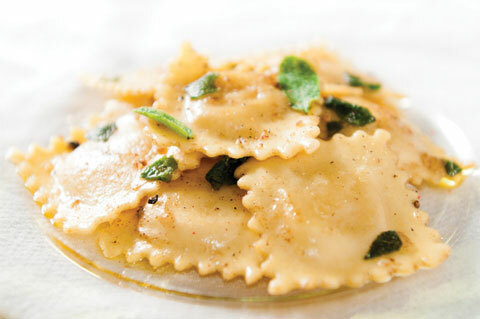 Because wonton wrappers make ravioli an easy dish, you can have homemade ravioli any night of the week. Set out a square of wonton wrapper in front of you. Place about a teaspoon of filling in the middle of the square. Using the tip of your finger or a thin pastry brush, brush the edges of the wonton wrapper with egg white. Place a second wrapper on top of the first, carefully pressing down the filling and removing as much air as possible, sealing the edges. Pick up the almost completed ravioli and make sure it is sealed all the way around. Place the completed ravioli on a well-floured board. Repeat until all the wrappers are used up, or you have the desired number of ravioli. To cook, gently slide ravioli into boiling water and cook for 2 to 3 minutes. Lift out with a slotted spoon and drain. Serve with your choice of sauce and cheese. Excellent with a drizzle of loose pesto over the top. Crumble the sausage into a frying pan and cook through. Drain. Stir up the ricotta so it's workable, and then add in the cooked sausage and mix well. Fill ravioli as directed. Delicious with browned butter and sage. Puree the roasted pumpkin, cheese, egg and breadcrumbs in a food processor until smooth.